When it comes to sharing information on how their school bonds are working out, most San Diego County school districts are doing fine, a taxpayer group said Monday — with the San Diego Unified and Sweetwater Union High School districts earning perfect marks. Of the 21 districts examined, only five failed to meet at least half of the criteria examined. Local community college districts were among those surveyed. 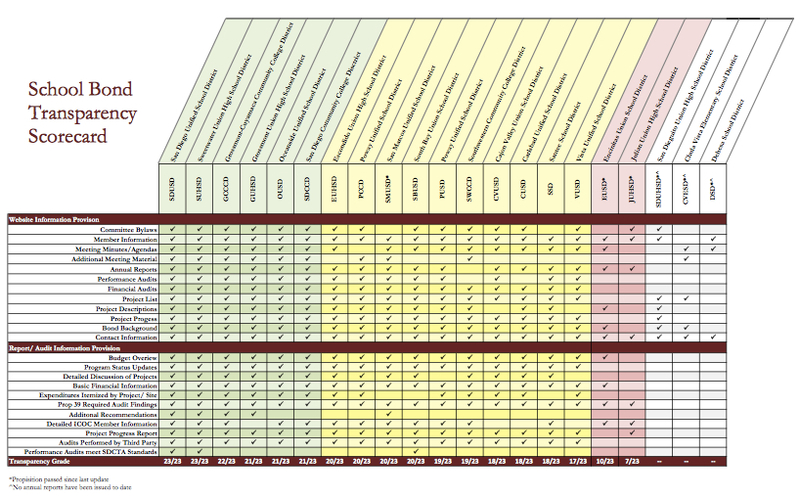 Taxpayer group’s Transparency Scorecard for 21 San Diego County school districts. In 2010, Encinitas Union School District voters approved Proposition P ( worth $44.2 million) and Julian Union High School District saw passage of Proposition L ($2.1 million). The two met fewer than half of the criteria on the Transparency Scorecard. Encinitas met only 10 of 23 transparency goals, while Julian met only seven, the report said. Both failed to post independent, third-party audits of their school bonds, for example. They also didn’t provide program updates or project lists. Comment is being sought from both districts. Such information is easier to find today than in the past, the group said. But in its first study of school bond transparency since 2007, the group found fault with Encinitas and Julian school districts. Nineteen districts were rated by the SDCTA’s educational foundation on how various types of information were made available on the Internet, or through reports and audits. The criteria included meeting agendas and minutes, annual reports, financial audits, performance audits and project progress. Public concern over school construction bonds grew two years ago when it was discovered that the Poway Unified School District issued a capital appreciation bond that leaves taxpayers in that area on the hook for paying back $981 million over 40 years, in exchange for borrowing $105 million to construct school facilities. State legislation was later passed to restrict the terms of such bonds. The highest ratings for bond transparency went to the San Diego Unified School District and Sweetwater Union High School District, which met all 23 criteria set out by the taxpayer’s group. The Grossmont-Cuymaca Community College District met 22 of 23 while the Grossmont Union High School District, Oceanside Unified School District and San Diego Community College District had 21. Prominently display on the home page of the district website information regarding a school facilities bond and the corresponding Independent Citizens Oversight Committee. Make all oversight committee meeting materials available on its web page. Use auditors with demonstrated knowledge in project management and construction industry best practices when conducting performance audits. And use the best established oversight committees as models when starting their own committees.